Shropshire based component manufacturer REO UK has joined the North Staffordshire Chamber of Commerce. Despite being a business from outside the area, REO has joined the Staffordshire branch in order to work effectively with its customers based in the county. 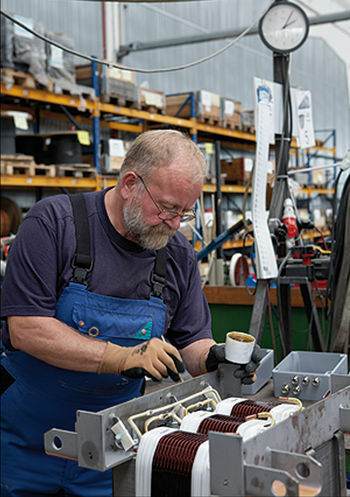 REO manufactures a range of products used in medium-voltage power systems. The company has wide-ranging experience in manufacturing wound components and is fully compliant with all relevant electrical regulations. Founded in 1925, REO now has manufacturing operations in the United States, China, Germany and India. The unusual move of joining a chamber of commerce outside a company’s home county comes as a result of REO’s strong relationships in the county’s industrial environment. Staffordshire is home to some of the largest and most well known engineering companies in the country. From Alstom, JCB and Broadcrown to Michelin, Sumitomo Electric and Goodwin, the region is steeped in manufacturing tradition. “A large number of REO’s customers are based in Staffordshire so being part of the North Staffordshire Chamber of Commerce was something that made perfect business sense for us,” commented Steve Hughes, managing director of REO. “The chamber has already provided us with opportunities to attend member networking events and information to help develop the business. For example, the work that goes on in the chamber’s North Staffordshire Manufacturing Group has made it much easier for us to understand the issues that affect our customers in Staffordshire. “Many companies don’t realise that they can join a chamber of commerce outside of their local area. While we don’t have premises in Staffordshire, our close relationship to the area meant that joining the North Staffordshire chamber was essential,” concluded Steve Hughes.